WAUKESHA, Wis. — Wisconsin Senate candidate Kevin Nicholson, a consultant for Fortune 500 companies, doesn’t look much like the renegade outsiders whom political strategist Steve Bannon says he’s recruiting for his war on the Republican establishment. But Nicholson has Bannon’s backing anyway, thanks to his loyalty to President Donald Trump. As Bannon drafts his team of challengers to the old guard, the new guard is increasingly aligned not by ideology, but by its history of support for the president. Republicans who have criticized the president or been slow to embrace him are out. One particular test for the Breitbart News chairman and former Trump White House strategist is how such Republicans reacted during the campaign to the 2005 “Access Hollywood” video showing Trump bragging about sexually imposing himself on women. Those who kept quiet about it or stuck with him earn Bannon’s favor now even if it means looking the other way on some policy positions and affiliations. Nicholson, for example, has backing from wealthy free-trade advocates, an awkward policy fit with Trump’s economic nationalism. “If you were never-Trump, refused to ever endorse the president or withdrew your endorsement following ‘Access Hollywood’weekend, don’t even bother walking through Bannon’s door,” said Bannon adviser Andy Surabian. Bannon hopes chiefly to topple Senate Majority Leader Mitch McConnell, whom he has blamed for obstructing Trump’s agenda, especially efforts to dismantle Barack Obama’s 2010 health care law. Bannon has threatened to find a Republican primary opponent for almost every GOP senator seeking re-election in 2018. 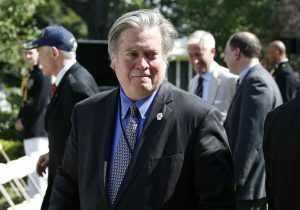 “The United States Senate in particular has done, I think, a terrible job in supporting President Trump,” Bannon told the California Republican convention last month. In Wisconsin, state Sen. Leah Vukmir is opposing Nicholson for the GOP’s U.S. Senate nomination. In last year’s presidential campaign, she first supported Wisconsin Gov. Scott Walker’s short campaign before shifting to Florida Sen. Marco Rubio. She helped record a pro-Trump radio ad a week before the election — perhaps too little, too late, in Bannon’s eyes. “The voters know I have been a supporter of Donald Trump,” she told The Associated Press last month. “I’ve traveled around this state and talked to countless people who want to see the president’s agenda move and are frustrated that it’s not happening.” She hasn’t said publicly whether she supports McConnell. Nicholson only recently swung against McConnell. He’s backed by the pro-trade Club for Growth, and in 2000, spoke to the 2000 Democratic National Convention as the national president of College Democrats. While Surabian said Bannon is generally “looking for candidates who support the president and his America First agenda,” policy unity is not a prerequisite. Nor is it a free-for-all. Some positions, such as supporting a route to citizenship for immigrants in the country illegally, would be a big problem for Bannon. Bannon thinks his nascent insurgency is already having results, thanks to the retirement announcements of two sharp critics of Trump, Republican Sens. Bob Corker of Tennessee and Jeff Flake of Arizona. In Tennessee, Bannon supports Rep. Marcia Blackburn, a popular conservative House member bidding for the Senate. She has McConnell’s backing, too. READ MORE: Can Steve Bannon’s revolt against the GOP establishment succeed? Bannon also has endorsed former Arizona state Sen. Kelli Ward, who lost her 2016 primary challenge to Sen. John McCain. Republican Rep. Martha McSally, who never endorsed Trump, is weighing a campaign for Flake’s seat. Yet Heller’s challenger, Danny Tarkanian, has supported trade treaties, specifically the Trans Pacific Partnership. Trump pulled out of the Obama-era treaty in January, a move Bannon praised. In West Virginia, Bannon is supporting Attorney General Patrick Morrissey over Rep. Evan Jenkins, a Democrat who switched parties four years ago to run for Congress. Morrissey, however, is no Washington newcomer, having been a lawyer for a Washington lobbying firm and later a lawyer for the House Energy and Commerce Committee before he moved to West Virginia.